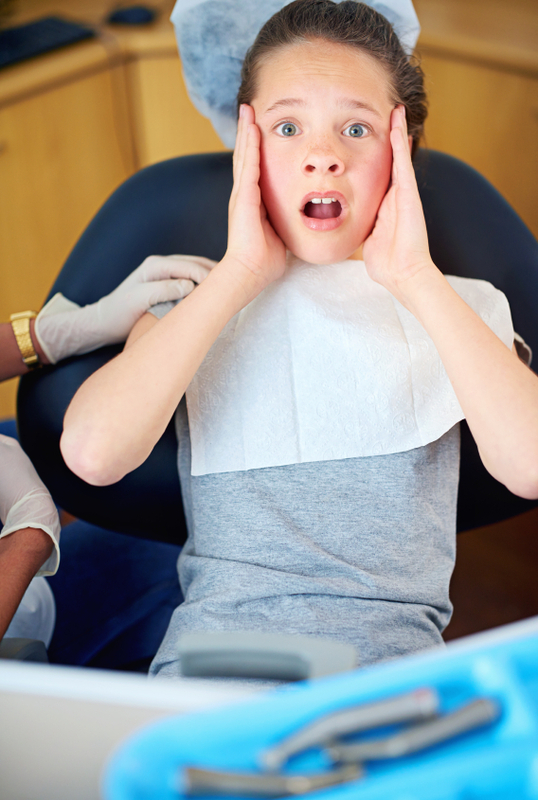 Dental Surgery Phobia - Find Out How You Can Cure It! Dental surgery phobia is basically an extreme fear of dentistry. ANY DENTISTRY. If YOU have a dental surgery phobia, even the slightest mention of certain words can bring on that gut-wrenching feeling of terror. A phobia is usually an extreme fear of something that is unfounded or irrational. But when you have a dental surgery phobia, it is very real. YOU don't care why you have it, you just know that you hate the very THOUGHT of going to the dentist. First, you turn up at the dentist's office in extreme pain, and so learn to associate pain with the dentist's office. And second, because you only go to a dentist rarely, your teeth are probably in a poor state generally, and you may be very embarrassed about this. This increases your fear. It's a vicious circle. One that is very hard to break out of, because most people with dental surgery phobia CAN'T BELIEVE that it would ever be possible for them to be able to see a dentist without fear. It's a bit like having a fear of heights, or of spiders. The fear of heights or spiders (or just about anything else) can be easily cured these days, but only if the person involved REALLY WANTS to overcome the fear for some reason, i.e. if they want to learn to skydive, or want to live in a hot country that has spiders. THEN they have a motivation for tackling their phobia. However, most folk with dental phobia can't imagine ever being free of their dental surgery phobia. To them, it just doesn't seem possible, and many people are suspicious of any attempts to help them. BUT THERE IS A WAY OUT OF DENTAL SURGERY PHOBIA! The FIRST thing to realise is that NOT ALL dentists are the same. There are MANY different ways to carry out any particular dental treatment, and it IS POSSIBLE to have TOTALLY PAINLESS dental treatment. And of course there are many different types of dentist - we are all human, and have personalities from all reaches of humanity! SO, imagine a dentist who behaves like a favorite uncle, or a best friend. They DO exist - you have to find someone who has a personality similar to yourself, and the only way to do that is to ask around your circle of friends and family! There are several options to help with dental surgery phobia. Which option will work best depends on the individual person, and sometimes a combination of options listed below will work even better! THE VERY BEST TOTAL SOLUTION IS MOST LIKELY TO BE DENTAL HYPNOSIS. If you have a severe dental surgery phobia, and you are IN A HURRY, then you can go straight to the following link to learn about HYPNOSIS DOWNLOADS. This page will tell you about how you can DOWNLOAD hypnosis files, and listen to them yourself at home, in your own time, at your own pace. Brilliant! If you want to SKIP straight to getting your dental phobia hypnosis download, go to this page; Hypnosis Downloads - Dental Phobia. This is EXTREMELY GOOD at helping people with a dental surgery phobia. Needles. This is very common. Nobody likes needles, myself included. I normally faint when I have to give a blood sample - so I know what it's like! The real fact, though, is that it's the person holding the needle (ie. the doctor) who is in control. In dentistry it's perfectly possible to give a PAINLESS SHOT. But the doctor has to take his time, and do it right! That leads us to the next factor - somebody else is in control! Most of us like to have a bit of control over what goes on in our lives, but when it comes to getting medical or dental treatment, we usually have to hand control over to the doctor. This takes a lot of trust. Noises and smells. I've put these two together because they don't actually DO anything. You just sense them. But the noises of dental instruments and the smells associated with a dental office are enough to put some people off completely. Vibration. This is the FEELING you might get when you have work done on your teeth. There is no pain, but you can sense the vibration/scraping. Some people don't mind injections, but cannot bear the sensation of having their teeth worked on. SO, what are the options to help? As always, prevention is better than cure. And most phobias start from a childhood experience. So it's a bit late to do anything with regard to prevention if you already have the phobia! But take a look at KIDS FIRST DENTIST VISIT if you'd like to help your own kids avoid a dental surgery phobia later in life. NEXT - you have to find a dentist who understands dental phobias and is sympathetic, AND who has the training and equipment to help you. His dental office will be a little different from a standard dental office. First, when you go in, there will be no typical dental smells, and you won't hear any sounds of treatment going on. It'll be more like the reception area of a spa hotel. If it doesn't, WALK OUT. When you meet him, he won't be dressed in a white doctor's coat, nor surgical scrubs of any color. He will probably be dressed in casual trousers and a polo shirt. IF HE ISN'T, WALK OUT. When he starts talking with you, he will listen to your concerns, and reassure you that, no matter how bad your teeth are, he has seen it all before and he will not be shocked by what he sees in your mouth. Remember, you are the patient, you are in control, and that first visit is just to have a look, have a talk, and find out what you need and what what can be done. NO TREATMENT on the first visit! Sounding good so far? There's more detail on these specific issues below, but first of all let's get back to dealing with the whole issue of dental surgery phobia head-on! HOW WOULD IT BE if you didn't actually worry about the individual specific things that trigger your phobia? I really believe very strongly that one of the BEST ways to treat a dental surgery phobia is with hypnosis. And you can start it BEFORE you ever go to the dental office. The biggest problem with hypnosis is the image it has - it is widely mis-understood. I strongly recommend this option, because it is drug-free, quick, effective and puts YOU in control. To find out how this works, and whether YOU might be suitable, please go to my DENTAL HYPNOSIS page. I promise, you'll find out some amazing things! I have checked out a lot of hypnosis websites, and by far my favorite is Hypnosis Downloads. They have a huge range of hypnosis downloads, including dental phobias, and their content is first-class. The specific link for a hypnosis download to help with dental surgery phobia is Hypnosis Downloads - Dental Phobia. This is EXTREMELY GOOD at helping people with a dental phobia. Assuming that you just want to find out about the specific issues triggering your phobia, and how to deal with those (rather than using hypnosis), let's take a closer look. For many people, a needle phobia is the first thing they think about. I have already talked about how to get a painless shot. Find out how by checking out that page! The next thing is some level of control over the treatment you get. This starts off with the dentist explaining the X rays he has taken of your teeth, and explaining what treatment you need, and why. Then you are in a situation of having some knowledge about what's going on, and making the decisions about what you want to have done (if anything!). Once treatment actually starts, many people can feel they lose control again. There are two ways to deal with this. One is to develop a degree of trust in the dentist, that he will stop whatever he is doing if you show the slightest sign of discomfort. In my office, we ask the patient to raise their left hand if they are feeling uncomfortable FOR ANY REASON WHATSOEVER. I tend to keep an eye on that left hand, and if I even see one finger start to move a fraction, I stop immediately. Usually, giving the patient this degree of control over the proceedings is enough to allow treatment to proceed. I have heard of a development of this idea, although it is not something I have done myself. I have read about a system whereby the dentist has wired up the dental equipment in such a way as to give the patient a "cut-off" button. This is a small hand-held trigger, that allows the patient to cut the power to the entire dental unit if they press the button! Of course, this gives them complete control to interrupt the treatment at any second.I think this type of system is rare in most dental offices for two reasons; one is that using all the other techniques is enough for 99% of patients, and the the other reason is that most dentists would not want to hand over so much control to the patient! Looking at the last two common causes for anxiety in the dental office, the smells and noises are something that most modern dental offices do not have. If you go into a new dental office for the first time, and you can smell that "dentist" smell, or you can hear treatment going on somewhere, just turnaround and walk out. Find another office. Period. The last problem, that of feeling vibration or scraping, is difficult to eliminate completely. People continually ask me about dental lasers, having heard that they are free of vibration. That point is true, but dental lasers are very limited in what they can do in dentistry. They work well for some types of surgery, and in a few types of new cavity, but they cannot remove old fillings nor tooth enamel, which is pretty much 95% of what dental air turbines ("drill") are used for . So, unfortunately, dental lasers are not yet a realistic alternative. So we have looked at what specific things in the dental office might trigger a phobic reaction, and I have explained a few options to help deal specifically with these issues. There are other options for those of you that want to just get straight into dealing with a specific dental problem or specific tooth. What we are talking about is some sort of sedation. BUT there are several levels of sedation. Oral sedation. This is the most straightforward. The dentist (or your medical doctor) can prescribe some tablets for you, to take the night before your dental appointment, and additionally one hour before your dental appointment. The most common medications are diazepam (Valium) and temazepam. Lorazepam is also sometimes used. BUT it's important to realise that these meds will NOT knock you out. You will actually feel pretty normal after you have taken them, and some patients tell me that they feel as if the meds haven't had much effect. BUT they are actually way more relaxed, and less concerned about dental treatment. One thing to remember is that these meds slow down your reactions significantly, and so you will need someone to drive you to the dental office and home again afterwards. You shouldn't operate any dangerous machinery (including driving a car!) for 24 hours. Intra-venous sedation. This is stronger, and involves a small injection in the back of your hand or arm. You get an initial shot which makes you feel very sleepy, and dental treatment is then carried out with the normal local anesthetics. You can have the shot "topped up" a little if you feel you are coming round a bit before treatment is complete. Again, you will need someone to drive you home, as you will feel quite woozy for the rest of the day. Most people just go home and sleep it off until evening. With intra-venous sedation, you normally remember very little about the treatment, even though you are actually conscious the whole time. Nitrous oxide ("gas") sedation. (laughing gas) You stay awake the whole time with this one, too. It's sometimes called "relative analgesia", and is actually a mixture of nitrous oxide and oxygen. You just have a small mask over your nose, (obviously, the dentist needs to be able to see your teeth to treat them!). This type of sedation is used for children as well, as it is very safe. You tend to drift off and have a bit of a day-dream during treatment, and the effects wear off much quicker than oral or intra-venous sedation. General anesthetic. This is the full-on aesthetic that would be used for a surgical operation in a hospital. You are completely unconscious for this. In dentistry it is normally reserved for serious conditions or for wisdom tooth removal. Few dental offices will offer this service for routine dental treatment because it carries a slightly higher risk of complications than sedation, and also it's more expensive as you need a fully qualified anesthesioligist (Anaesthetist in the U.K.) to give the aesthetic and monitor you throughout the entire procedure. Coping with a dental surgery phobia is very difficult, but there ARE ways of getting round it. Again, I urge you to take a look at my DENTAL HYPNOSIS page. I believe that this option is way out in first place as the best solution. In second place is daylight. Dental hypnosis is relatively inexpensive, easy to get, and can deal with ALL the things that may trigger your dental phobia. The other options I have written about can also be helpful in certain situations, especially when you need some urgent attention. I wish you Good Luck in getting rid of your dental surgery phobia!